Carla Hall told The Chew crew and the audience that Coconut Layer Cake is one of her all-time favorite desserts. Good thing it was chosen for this Viewers’ Choice episode with a Southern Comfort theme. What’s also fabulous is how easy the dessert can be to make, with a little advance preparation. Pie fans will also want to check out The Chew’s Coconut Cream Pie Recipe. She said that this cake is perfect for almost any occasion, and she suggested taking it as a hostess gift. Carla did a two-stage method for this recipe, but it is not as complicated as it might sound. Just combine wet and dry ingredients separately before bringing them together. This will prevent over-mixing the flour proteins. 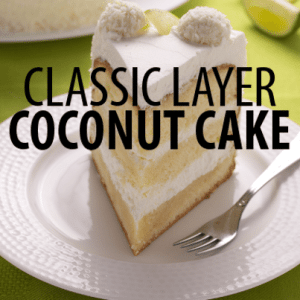 You can make a delicious and decadent Southern comfort dessert that is one of Carla Hall’s most favorite creations, The Chew’s Coconut Layer Cake recipe. You could also use a box cake mix to come up with the dough if you are pressed for time, Carla said (but that’s probably not quite as classically Southern). Whatever you do, divide the batter in thirds for thinner, more moist layers. To make the frosting, combine the ingredients in a bowl and chill overnight. Bring all cake ingredients to room temperature. Combine dry ingredients in a standing mixer. Use the paddle attachment on low for 30 seconds. Stir in oil with butter and mix well. Combine wet ingredients in a bowl with a whisk. Pour wet mixture into the mixer and paddle on medium to fully combine, about two minutes. Divide batter among three prepared 9” cake pans. Bake the cakes for 10-15 minutes, until it passes the toothpick test. Let cakes cook about 10 minutes before flipping onto baking racks. Completely cool before frosting the cakes. Frost between each layer and frost the entire outside area of the cake. Let chill for up to four days before serving.